Explanation: This August was eclipse season. The month's first New Moon and Full Moon were both seen in darkened skies during a solar and lunar eclipse. Blocking the Sun, the left panel's New Moon was captured during the total solar eclipse of August 1 from the path of totality overlooking Novosibirsk (Siberia) Reservoir, locally known as the Ob Sea. 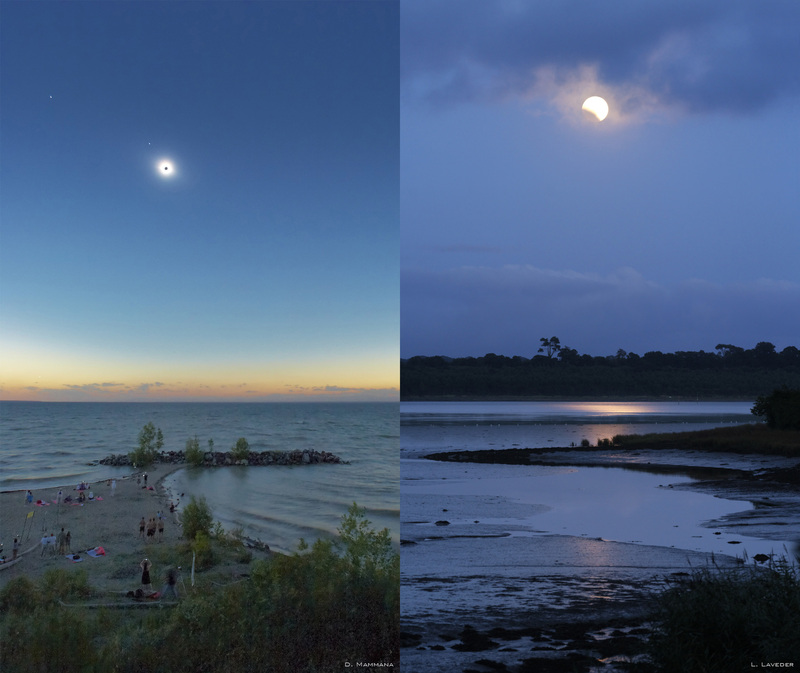 A lovely solar corona and bright inner planets Mercury and Venus emerged during the total eclipse phase, while the flickering view screens of eclipse watchers' digital cameras dotted the landscape. On the right, the Full Moon grazed Earth's shadow nearly 15 days later in a partial lunar eclipse. That serene view was recorded during an early evening stroll along the shores of the Odet River near the city of Quimper in western France. For planet Earth there are about two seasons each year during which the orientation of the Moon's orbit is favorable for solar and lunar eclipses. The next eclipse season begins in January 2009 with an annular solar eclipse.